Two mango smoothies, one a Mango Lassi with Fresh Mint, another that mixes mango and beets, creating such beautiful color and best of all, plant-based sweetness without refined sugar. Swoosh! I hadn’t thought of my “first time” story for years but once she asked, suddenly there I was, whisked back in a mango time machine to the Washington Mall on the 4th of July where a man with a pushcart was selling mango and papaya so ripe, we bent at the waist to stop the juices from dripping to our elbows. So yeah, that’s my mango story, what’s yours? ALANNA’s TIPS A Mango Lassi is an easy addiction! If you can’t find fresh mangoes, look for jars of mango slices in the produce section of larger supermarkets or cans of mango purée in a market that sells Indian ingredients. Trader Joe’s some times sells bags of frozen mango pieces, they’re great. For an extra-special treat, when making the Mango Lassi, substitute a dollop of sour cream for the yogurt. Delicious! Beets might seem like an odd addition for a smoothie but they really work. Beets are sweet – so offer up a plant-based source of unrefined sugar. And the color is gorgeous! Some of the natural earthiness comes through but it’s really the mango that carries the flavor. If you like, set aside a few cubes of mango for garnishing. 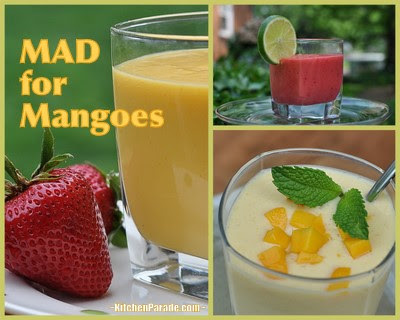 Mix the mango, milk, yogurt and extract in a blender or food processor. Take a taste, then decide how to proceed, sugar may not be needed at all. Serve and enjoy! Mix the mango, milk, beets and lime juice in a blender or food processor. Serve and enjoy! NUTRITION ESTIMATE Per Half Cup: 50 Calories; 1g Tot Fat; 0g Sat Fat; 2mg Cholesterol; 58mg Sodium; 10g Carb; 1g Fiber; 8g Sugar; 2g Protein; Weight Watchers Old Points 1, PointsPlus 1 SMOOTHIE FOR DIABETICS? Others may have the same experience as here. Drunk slowly, a full cup of this smoothie sweetened only with beets, no refined sugar, did not create a sugar spike. Not up for a Mango & Beet Smoothie? Okay, how about a Banana Mango Smoothie? or a Cantaloupe Smoothie? 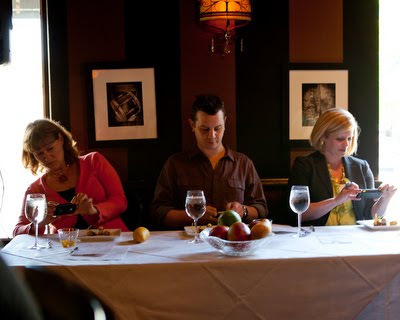 Ever wonder what three food media people might do before tasting a dish? Pull out our cameras, of course! Last month, the National Mango Board came to town pitching mangoes. Two top St. Louis chefs, Josh Galliano of Monarch Restaurant and Nick Miller of Harvest were charged with creating dishes that captured the "local" flavors of St. Louis. Judging the event were me (on the left in the mango-colored sweater, of course! ), Evan Benn (in the center) who writes the Hip Hops beer blog for the St. Louis Post-Dispatch and Katie O'Connor (on the right) from the wonderful Sauce Magazine. When the first dish came out, each one of us, without prompting and without realizing the others were doing it too, pulled out our cameras. St. Louis photographer Jonathan Gayman caught the moment! (More pictures? See Jonathan's blog, Shoot to Cook.) I was also pleased to meet two new-ish St. Louis food bloggers for the first time, Natalie McLaury of The Sweets Life and Libby Tempel of Cafe Libby. Vegetables 101: What Is Jicama? Mango and beets? Interesting combination!